- Be clear on what your mortgage business stands for. What’s your promise is. Knowing this will not only help you put out consistent messages and attract the right clients, it will also help you build a network that is filled with the right people and develop a strategy that is aligned with your promise. A must if you want to build a brand. - Make sure all of your marketing materials- website, photos, flyers- have the same look and feel. 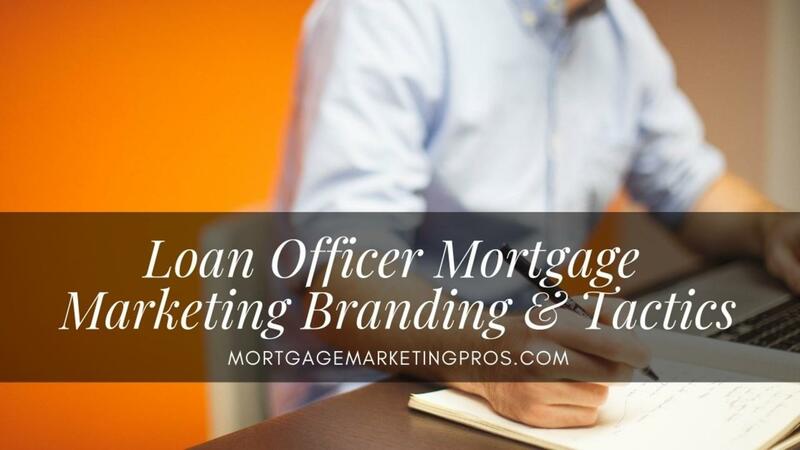 Also make sure that your message, and how you want the market to view you as a loan officer is clear and consistent on all your mortgage marketing efforts. - People love a good story. Craft your own around why you started your business as a loan officer and then tell it through your website, social networking pages and blogs. Let your story and personality shine through – it’s another way to build trust and appeal to clients. - Use templates and create brand standards for your marketing materials. Apply the same color scheme, logo placement, look and feel throughout. You don’t need to be fancy- just consistent! - If you are starting out, work on your personal brand to get that first client over the line. Your appearance is an important part of marketing yourself. A tough issue to tackle but if you think you could look a little sharper - think about getting an independent opinion from an image consultant. - Use benefits and emotional language to engage your target market in your key messages. A loan officer doesn’t have a “mortgage” in her/his brochure, but a “Home Loans - Dedicate loan officer to guide you through the journey of purchasing or refinancing a home”. Be proud of what you offer, dress it up and sell not just a service, but an experience that appeals to your target market. - Fake it til you make it! An important skill of any loan officer is to be able to look bigger than you are. The easiest way to do this is by having polished marketing material, always being professional and although your business may be small, still thinking big! - How you treat staff is just as important as how you treat clients when it comes to building a reputation. What would previous employees, partners, realtors say about your business. Ex-staff are also an opportunity for leads and new business. - Focus and consistency, will stop you wasting time and money on tactics that don’t work. By relentlessly focusing on a few tactics your marketing WILL achieve results. - Need some creative work done but don’t have a lot of money? Consider using canva.com it's a free web app that allows you to design professional marketing materials easy. - If you have the budget think about sponsoring a local sporting team to get your brand in front of your target market. You can provide branded merchandise such as drink bottles or sports bags to the junior team, have signage rights and logos on uniforms, sponsor an achievement award for up and coming players which can provide the opportunity to attend social functions and generate good PR. Let everyone know what you do, and you are hear because you would like to be part of the community. - Identify businesses who you don’t compete with who have the same target market as you. What could you offer them that would be of benefit to their clients. Great examples are accountants, tax preparers, home insurance agents. - Brand everything. Where possible have prominent signage, brand your car, t-shirts, create a branded email signature, newsletter, use pop-up banners whenever you can for functions and promotions. You can never have your brand visible in enough places. - Keep on top of your competitors’ activities (other loan officers) and know what’s happening in your market. These days it’s so easy to keep informed through blogs and social media, joining email databases and using services such as Google Alerts and Compete.com to track competitor activity online and offline. - Understand what barriers are facing your clients. What is stopping or would stop them from using your programs? Tailor your marketing approach, your services and programs to address these barriers. Some common barriers include an inconvenient and the unknown of the home loan process, perception of your brand, clarity and trust. - Make a list of the key influencers in your target market or local community, and send them information on your mortgage loan programs, and show them how you can add value to their community or group. Word of mouth is the best kind of exposure, and your generosity will get them talking. - Align with other like minded loan officers and top producers and swap ideas. You will be surprised of how much these top producers like to share; ideas, strategies, what worked for them, what did not work for them and so on. - What makes good direct mail? The secret to making it work is to think small (target your recipients), make it personal, add value, and follow-up. It will also help if the mail is eye catching! Follow up telemarketing or a postcard with similar creative to your original mail will increase your overall response. - Market research doesn’t have to be expensive. It can be as simple as talking to your clients, run a focus group or develop a short questionnaire that they can either fill out in person, on line, or by phone. Websites such as Survey Monkey are an easy way to do this. - Always be prepared. Research your prospect, understand their needs, and how your programs/service will benefit them. A potential client will feel much more inclined to do business with you if you are confident and prepared. - Consider installing a “live chat” app on your web site. You can offer visitors to your web site the opportunity to ask a direct question using a “chat application” on your site. This will help convert site visitors to clients. - Track and regularly evaluate your marketing tactics. Have measurements in place so you know what is most effective- it will save a lot of time, effort, money and resources when you know what is working best for your business! Use a simple database and invest in web site tracking tools such as Google Analytics. - Always try to learn something from every experience- even if it’s a bad one. If something doesn’t work – don’t be put off – learn what went wrong and why, so your marketing activities can only become more effective and improve your business results year after year. Make sure you get feedback from every lost prospect. - Use testimonials- they are one of the most powerful marketing tools. Positive, believable comments from real clients are proof to other potential clients that you are worthy of their business. Always ask for feedback and testimonials after a job well done. - Video is a powerful new marketing tool. Film yourself giving away tips, showing someone “how to” do something, your clients sharing how you’ve helped them, anything as long as it’s useful. You’ll be surprised how much video can create cut through. - Building trust is critical to effective marketing. Think through how you can build trust with your marketing? Give away knowledge, volunteer your services for a charity or club. Create some FREE helpful materials, run some free events. - Be proactive with your marketing. See a new business open up in your local area? Introduce yourself, give a sample, drop in if you think you could provide them a service (e.g. printing, design, cleaning, their first coffee, etc)! Kick apathy out of the way and market with a proactive mind set. - There are many benefits to keeping your marketing copy short and sweet than just saving ad space. Clear and concise messages stand a better chance of being read in their entirety, versus long-winded messages weighed down with empty and overused words, such as “solutions”, “dedication”, and “exceptional”. - Save on your marketing budget by negotiating. Often the advertised price for media, sponsorship, exhibiting at events etc, is very negotiable. The next time you are booking advertising, taking out a sponsorship or exhibiting at an event, make an offer! You’ll be surprised how much you can save. - Use bullet points and bold in key copy on your web site, newsletters and direct mail letters. People tend to “skim” content (particularly online) so make sure your key offers, benefits and call to action stands out. If you follow these mortgage marketing strategies, tactics and tips constantly your career as a loan officer will start flourishing sooner than later. Also don’t forget to download our free guide on How to market to real estate agents - Loan Office Guide.